Raphael Sbarge, known as Jiminy Cricket and Archie Hopper on ABC’s Once Upon a Time sat down for an interview to talk about himself and the show. Sbarge has been seen in Risky Business, Message in a Bottle, Pearl Harbor and Independence Day. Sbarge grew up as the child of a Broadway costume designer and always surrounded by the theatre. Interviewer: Growing up in the theater world, did you understand the glamour that surrounded you? Interviewer: As being in the theater business as a child, what was a typical day like? Raphael: At four years old, a new show Sesame Street was looking for kids, his mother did not take a new show him to casting because she did not want to be a stage mother. At 13, he decided he wanted to become an actor. His mother said Sbarge had to do it on his own. That was what he did with his bus pass running around the city. He went to high school during the day and after school were auditions. His first Broadway play was at 16 years old and Risky Business was at 18 years old. Interviewer: Being surrounded by actors your entire life, was there one that helped you become who you are today. Interviewer: What is your favorite show that you can watch over and over? Raphael: He said, “A Delicate Balance with Elaine Stritch.” It leaves one in a place to feel almost like jelly once the curtains come up. Almost as if one’s DNA has been arranged. Interviewer: On the blockbuster movies you played, which one was your favorite? Raphael: He did not say if he had a favorite. He is just proud to be where he is at and spread his wings on a variety of roles. Interviewer: On television, has there been a favorite role? Raphael: For the role as Jiminy Cricket so far he said has been thrilling, exciting dynamic and the most tragic of anything he has done in ten years. Interviewer: Bringing up Once Upon a Time, tell us about it. Raphael: He finds himself in knots trying to talk about the show and says you really have to just see it. It reminds him of similar moments to Harry Potter or Princess Bring. There are in a fantasy and reality world, where there is a cross back and forth. Raphael: There is a young boy named Henry that sees a therapist. In the reality world, he plays the therapist named Archie Hopper. His character is always trying to do the right thing. Archie interacts with all the characters in Storybrooke, where he gives them strength and direction. He especially works with Henry’s character. In the fantasy world, he plays Jiminy Cricket. We found in the previous episodes that his story was where the conscience came with a great price. He plays the role of a character where he went through a painful and difficult journey. Interviewer: Do you think the two worlds will come together this season? Raphael: He said he does not know the answer yet. Currently, they are working on episode 15. What he did say was they took a page from the LOST handbook. It goes into a deep dive into the lives with some of the characters like the Queen, Snow White, Price Charming and the Sheriff. No one actually told him much yet. However, in his opinion they are laying out the landscape for Operation Cobra and the beginning battle. Interviewer: Will anyone start listing to Henry and his fairy tale accusations this season? Raphael: The sheriff seemed to believe him by the end of his episode, but it will be interesting to see how it works out. Interviewer: Will season two continue the same stories or will it be a different theme? Raphael: He has no idea what the writers have in mind. He pointed out he never knows what is coming next. Interviewer: Are there any shows you watch on a regular basis? Interviewer: Do you watch Once Upon a Time with your kids? Interviewer: Do you use Twitter or Facebook to interact with fans? 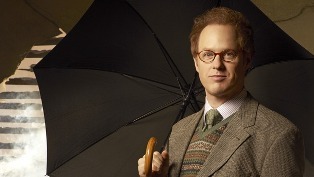 Raphael: His twitter is @RaphaelSbarge and he has a facebook fan page. Interviewer: Any projects in the works? Raphael: He said not a lot of file stuff right now. He is doing a video game called Mass Effect 3, and this comes out in March. In addition, he is doing an internet series with Ed Begley Jr. It is about building technology advances homes in the world. He is also the founder of Greenwish, which is a non-profit organization. Interviewer: Anything to tell your fans? Raphael: He said how thankful and touched by the love and affection for the show. He is very grateful to be working with amazing artists. Previous Previous post: Episode 10: 7:15 A.M.